The CSU One Health Club supports the global One Health Initiative through organized involvement and collaboration with the environmental, public, and animal health communities. The One Health Club is dedicated to providing a broad base of student involvement and provide a forum for the discussion of health-related issues facing humans, animals, and the ecosystem. The OHC recognizes that there is an inextricable link between the health of all species and their environment, and that a holistic approach to these issues is needed. Please use the ‘Contact Us’ link if you’re a student, research or faculty or community member interested in learning more about the club, or events or membership. 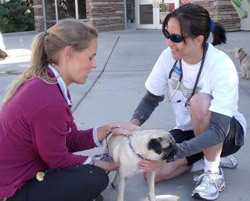 Read the CSU One Health Club Constitution (PDF).